The weather station is a Davis Vantage Pro. It's located on our upper back deck about 300 yards from the base of Cathedral Ledge. The weather you see on this site is actually what's occurring right now here at the cliff! To get the complete picture check out our Cathedral Ledge Webcam. 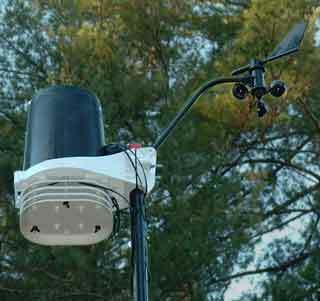 If you are interested in what the weather station looks like CLICK HERE. NOAA Text Forecast (scroll down).